Pikachu partakes in Target Blast in Super Smash Bros. for Nintendo 3DS. Target Blast (スマッシュボンバー, Smash Bomber) is a Stadium sub-mode in Super Smash Bros. 4. The player is tasked with inflicting damage to a bomb on a platform, then launching it into a structure composed of various blocks filled with Targets, with the goal of destroying as many targets as possible in two rounds. Bowser Jr. competing in Target Blast. Here, the bomb has five seconds remaining. The bomb's 10-second timer starts when the player touches or attacks it. When the bomb is hit with a powerful attack, it is sent flying, destroying most objects in its path. Halfway through the round, the announcer will start the countdown just like in a standard Smash with only five seconds remaining. When the timer hits zero the bomb explodes, destroying any objects around it, as well as potentially starting physics-based chain reactions due to the blocks around the blast radius being dislodged. As a result of this, much of the strategy in Target Blast comes from deciding when and how the bomb should be launched. In Super Smash Bros. for Nintendo 3DS the two bombs are the same size, while in Super Smash Bros. for Wii U the second bomb is bigger. If the player fails to launch the bomb out of the starting platform before it explodes, the bomb will explode and send the player flying with enough knockback to be KO'd (or a shield break if holding up their shield), before they receive a score of zero for the round. Super Smash Bros. for Wii U features three separate stages with different layouts, with only the first one being shared with Super Smash Bros. for Nintendo 3DS. Every session of Target Blast is composed of two rounds, with the final score being the combined score of both rounds. The player may choose to retry the first round by pressing B, or move on to the second round for an even higher score. The scores in this mode are used as part of Global Smash Power. Breaking all 15 red targets (27 in Stage 2 and 23 in Stage 3) awards the player with a Perfect! If this occurs in the first round, the structure will be rebuilt for the second round. Trophy or Custom Part targets may randomly replace one of the red targets, and destroying them yields the indicated reward. For unknown reasons the bomb has an extremely high falling speed when launched straight upward. Each type has a point value associated with it. The value increases when the bomb detonates, giving the player even higher scores. Playing Target Blast for the first time adds the possibility of Xerneas appearing in a Poke Ball and a Master Ball. Destroying all the red targets grants the player the Steampunk Outfit. Getting a score of 200,000 grants the player the Explosive Punch custom move for Mario. Playing Target Blast with all characters grants the player the Dark Train trophy. Getting a combined total score of 2,000,000 grants the player the King Bob-omb trophy. Scoring at least 80,000 points in a single game of Solo Target Blast Stage 2 as Palutena while using the back wall grants the In the Space-Pirate Ship music track. Scoring at least 120,000 points in a single game of Solo Target Blast Stage 2 as Toon Link grants the Lor Starcutter trophy. Scoring at least 150,000 points in a single game of Target Blast on Stage 1 unlocks the Exploding Popgun custom move for Diddy Kong. Scoring at least 150,000 points in a single game of Solo Target Blast Stage 1 as Zelda grants the Wolf Link trophy. Scoring at least 150,000 points in a single game of Solo Target Blast Stage 1 as Bowser Jr. grants the Countdown Drill equipment. Scoring at least 200,000 points in a single game of Target Blast Stage 2 unlocks the Dire Hydrant custom move for Pac-Man. Scoring at least 200,000 points in a single game of Solo Target Blast Stage 3 as Ness grants the Jeff trophy. Scoring at least 300,000 points in a single game of Solo Target Blast Stage 3 as Pac-Man while using the back wall grants the Whomp trophy. Scoring at least 450,000 points in a single game of Target Blast Stage 3 grants the Magolor trophy. Getting a perfect on any stage in Target Blast grants 5,000G. Getting a perfect on every stage in Target Blast grants 20,000G. Stage 1 in Super Smash Bros. for Wii U. This is also the only stage in Super Smash Bros. for Nintendo 3DS. The second round with a bigger bomb in Super Smash Bros. for Wii U.
Touching or attacking the bomb lights the fuse and starts the 10-second countdown. Donkey Kong damaging the bomb. An example of a bomb detonation and the beginning of a physics-based chain reaction. If all of the red targets are broken, the player will be awarded with a Perfect! The scores in both rounds make up the final score along with the total GSP. The explosion of the bomb used in Target Blast has well over enough power to OHKO in normal conditions. It also completely fills Little Mac's Power Meter and Cloud's Limit Meter, and is capable of instantly breaking full shields (including Shulk's shield when boosted by the Shield Monado Art). In a Pic of the Day on Miiverse, Masahiro Sakurai mistakenly refers to Target Blast as Target Smash, a mode that appeared in previous games but is not present in Super Smash Bros. 4. Some tickets in Master Orders involve getting a high score in Target Blast. These tickets allow custom moves to be used (and used to allow equipment as well until version 1.0.8), something that is not normally possible when playing Target Blast. Target Blast resembles the popular mobile game Angry Birds, where the focus is to topple buildings and destroy the Bad Piggies dispersed throughout the stage by launching round birds as projectiles from a distance. The bomb functions similarly to Bomb (aka Black Bird), who explodes either when the player taps the screen or after a set amount of time passes after he touches an object/a piggy. 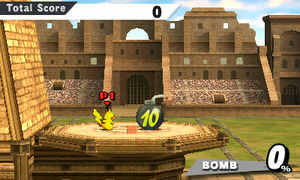 In Super Smash Bros. for Nintendo 3DS, attacks that usually cause a "screen-shaking" effect will not shake the screen while in the Target Blast stadium. The same goes for the Home-Run Contest stadium. This page was last edited on October 9, 2018, at 22:06.